This volunteer (unpaid) position reports to the Museum Educator. Docents lead groups on engaging tours through the museum’s exhibits and present educational workshops on topics ranging from music to George Washington Carver to the Underground Railroad. Docents help teach student and adult groups invaluable lessons about African American history, inclusion, and diversity. Volunteer docents should have an energetic, engaging personality and be comfortable speaking to audiences of all ages. Interest or experience in a formal or informal education setting is advantageous, but not required. The ideal volunteer should be dependable, have an enthusiastic personality, a positive attitude, and an interest in the Museum’s mission to preserve, exhibit, and teach the African American history of Iowa. Tour scripts, workshop materials, and training are provided by the Museum’s education staff. Business casual dress is required. Tours are scheduled through the education department at least seven days in advance. Tours happen between 9 am and 4 pm, Monday through Saturday. Docent scheduling is flexible and will occur on an as needed basis per the docent’s availability. Each shift requires a 1.5 to 3-hour commitment. 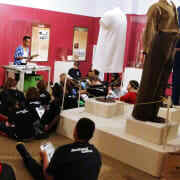 Docents work on-site at the African American Museum of Iowa at 55 12 th Ave. SE in Cedar Rapids, IA.